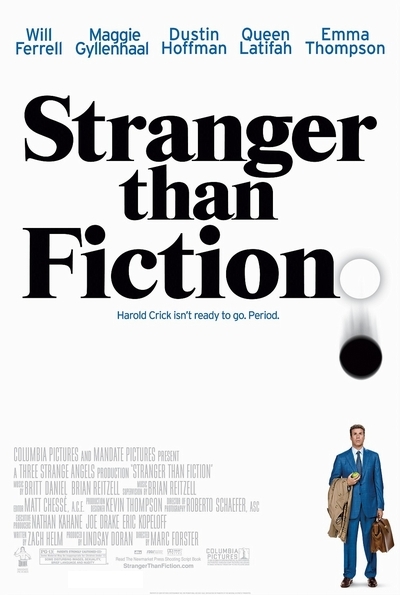 Story: In "Stranger Than Fiction," Will Ferrell plays Harold Crick, an IRS Agent whose world is turned upside-down when he begins to hear his life being chronicled by a narrator only he can hear. The Narrator, Kay Eiffel (Emma Thompson), a nearly forgotten author of tragic novels, is struggling to complete her latest and best book, unaware that her protagonist is alive and uncontrollably guided by her words. Fiction and reality collide when the bewildered and hilariously resistant Harold hears the Narrator say that events have been set in motion that will lead to his imminent death. Desperate to escape his fate, Harold seeks help from eccentric English professor Dr. Jules Hilbert (Dustin Hoffman) and finds unexpected comfort in a burgeoning romance with a defiant audit subject, Ana Pascal (Maggie Gyllenhaal). Unluckily for Harold, Kay's impatient publishers have unleashed a stern assistant named Penny Escher (Queen Latifah) to help the author finish her book and finish off Harold Crick.